Employee engagement has been consistently cited as a top and growing priority by CEOs, managers, and human resources leaders across the country. 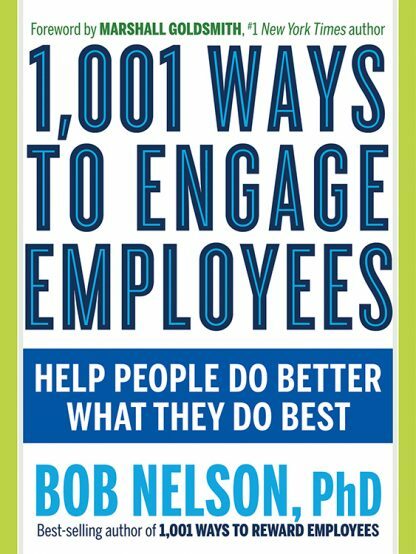 This new title from best-selling author Dr. Bob Nelson will help move any organization from just measuring the need to engage employees to actually changing management behaviors that will lead to a stronger culture of engagement. Your organization will become more effective at both attracting and retaining talent and maximizing the contribution of your employees. Categorizes specific research-based factors proven to impact employee engagement. Cites hundreds of examples of what other companies are doing to enhance employee engagement�ideas you can use right now. Offers practical insights and advice from hundreds of clients Dr. Bob has worked with. Highlights the key research on employee engagement you need to know and use. Is the only resource on the market that guarantees behavioral change on the part of your leaders that will deliver desired results. Employees are your company�s most important asset. Attracting the best, getting them to do their best work, and keeping them in the organization are critical to your company�s success. 1,001 Ways to Engage Employees gives you all the powerful tools you need. Dr. Bob Nelson is a leading authority on the topics of employee engagement, motivation, recognition, and retention. His many books have sold more than 5,000,000 copies and have been translated into 20 languages. He has spent his career researching best practices and helping managers and organizations implement strategies and practices to enhance the employee experience and achieve greater results for both the organization and employees. He frequently presents for corporations, conferences, and associations across the country and around the world and has been featured in national media such as the New York Times, the Wall Street Journal, and CBS 60 Minutes. He lives in San Diego, California.